Some neighborhoods have many stray cats wreaking minor havoc in trash, gardens, etc. There are ways to resolve this issue and perhaps help the cats as well. This is a guide about dealing with stray cats. I am trying to help some stray kittens. One has pus in its eyes, runny eyes. One is blind. They are wild kittens. I have tried a lot of different medications. Is there something I can make at home to use? Meds are very costly when wild cats just keep coming. We do not have a no kill shelter in Fontana or one that will take them. I am caring for 50+ cats, none of whom are house cats. The cost for food has wiped me out. If anyone knows of someone to help with food it would be of great help. Thank you for your help. 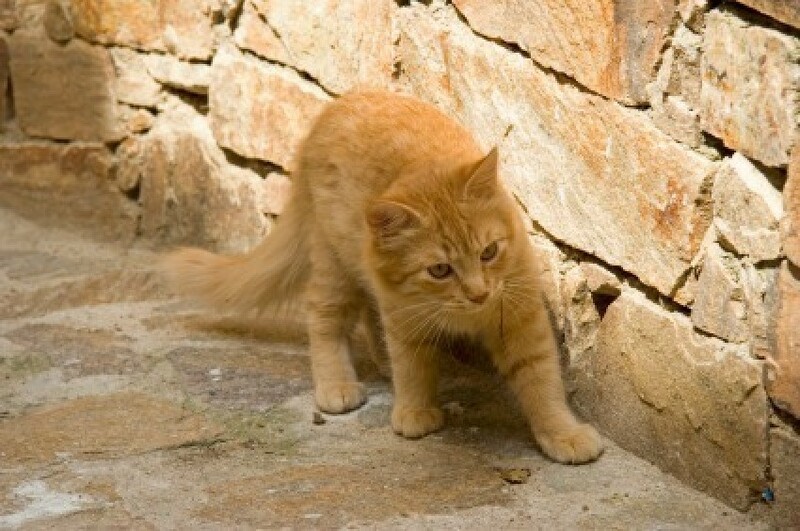 How can I keep stray cats out of my garden? I sprinkle cayenne pepper in my gardens wherever the stray cats start to dig. The next time they start digging they get a whiff of the pepper and decide it might be nicer to dig at home. Re: the stray cat problem, there are some aerosol repellents sold at pet stores and garden stores that might work. Also, supposedly citrus peels in the garden keep the kitties away. You could try it. The cats probably like the soft mulch or nice soil of your garden beds. I have simply learned to live with the "problem" in my area, but I do plant my garden very thickly, so that once it's grown in, it doesn't make an inviting kitty litter. But one "plus" is that the cats often keep the mole and mice population down. Gina if you are speaking of cats digging in your garden beds here is what you do. Lay chicken wire over the soil, the plants will grow through it. The cats do not like the feel of the chicken wire on their feet and will stay out of the garden. This sounds terribly gross, but usually garden supply stores will have what is called 'predator urine' packets that you put around your garden. This alerts the cats, in your case, that there is danger and they will go away without bothering anything. (Don't think it is something that humans can detect, but the animals sure know what it is. Like cougar urine for keeping deer away, etc. Good Luck! Most of the time oranges will work, just cut them up and throw them out there in the garden. 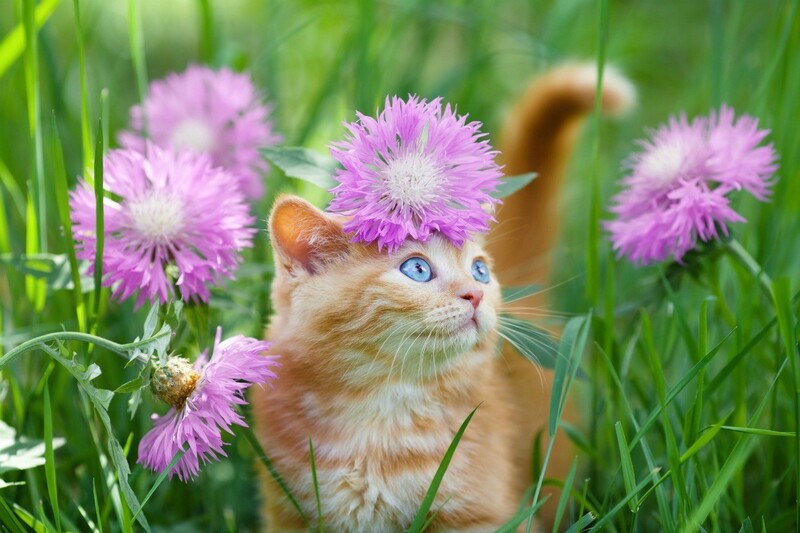 It may be a little bit of a hassle, but cats do not like, and will not dig in wet soil. I never have a problem if I keep the garden area wet. Are there any natural detterents for cats - mine is digging up rug in places (near doors) and the store bought kind does not work. I have too many cats and don't know what to do. I have one inside female kitten who's been spayed, she's no problem. I have two female and one male indoor/outdoor cats who have also been neutered, they're no problem (although one doesn't get along with the others). However, There are two outside male strays, presumably unneutered, although one has a flea collar on so someone owns him and may have had him neutered; two female strays unspayed, one with 2 kittens (male and female) unneutered. The outdoor females and kittens are not friendly enough to get near, they run whenever we go outside, but will eat food we put out for them. My question is, if I can't get near them how do I get them neutered? If I don't get it done, we'll be absolutely overrun with cats and I know it has to stop before that happens. What do I do? Can someone please help? Pet stores sell cat trapping cages. (around $45) The local rescue places will often loan or rent them out. There is often help too with low cost spaying with certificates from local organizations. Call a vet to find out who has them. Our sherriff's department here in California passes them out when they are available. The cages work real well, we have to trap feral cats fairly often. First of all, you need to determine if they are strays or drop-offs. You definitely don't want to have an irate neighbor on your door-step. If they are one, or the other, then you have a couple of options. 1. You can try to win the animal's trust, by being gentle, and enticing by food, try to trap it, whatever you have to do. 3. If the owner doesn't come forward, you can either call Animal Control to come pick it up, or, you can have it spayed or neutered, and consider yourself the proud owner of a new cat. 4. Some vets have told me, " if you feed it, it's yours". Call the animal control officer in your town. They have strategies and equipment to deal with situations like this and will help you capture the animals. If the cats are strays, there may even be a rescue organization in your area that provides low-cost or no-cost vet care. The ACO will know or your own vet with know, and it doesn't cost anything to ask. Place white pepper powder in those areas. Cats always sniff and scratch before going to the bathroom. I have the same problem and it really works. Also it won't hurt anyone, it will just annoy the cats until they find other places to go. Do the pet population a favor and trap him with a cruelty -free trap. Sometimes the local humane society will loan these out. Then get him neutered. There are feral cat rescues that can help with costs, but neutering is fairly cheap anyway. I've never known a cat that likes mothballs, and only one that can tolerate the smell of vinegar. You might consider spraying the porch and surrounds with undiluted vinegar. You'll have to redo every day or two for a while (or if it rains), but it's better than the smell of cat urine! If this doesn't work, you may want to put mothballs by each corner of your porch. Good luck! Call you local rescue groups and ask them to pick the poor cats up. They are in need of medical care then they will be put up for adoption. It is inhumane to force a cat to go outdoors, these kitties will be better off in a loving family. Lurk by an open window and squirt him with a strong jet from a water pistol. Not harmful but the surprise.shock will deter him from coming back as he will then associate your porch with the surprise. You may need to do it a couple of times. I've also heard citronella oil works (outside! ), but avoid using it on cement or similar surfaces as it will stain. I let my cat out for her daily wander, but she keeps getting bullied by other cats. They are coming almost to our door. She is desexed. What can I do? My son and daughter-in-law just purchased a house and the cats around their house seem to think that it is their own litter box. Is there something that can be put out to repel them, without harming them. Mom has an indoor/outdoor cat. Recently a hungry stray has been hanging around and we have left food out for him. Now, he comes by all the time and that would be OK, but he started to attack mom's cat when she's outside. She won't go out when she sees that he is out there. Should I stop feeding him so he goes back across the street where I think he came from? He is huge and eats twice as much as mom's cat! We were not prepared for this stray taking over our lives and bullying our own cat, that can't go on. Any ideas? I have a bad cat problem in the town I live in and just discovered there are some living under my trailer. They are peeing, pooping, and spraying under there. I would block it off, but I have like 5 feet of snow and ice all around my trailer. They are also spraying my back door and all of these smells are starting to come in. Any ideas on how to stop it all would be so nice. Thank you in advance. Question: How Do I Keep Cats from Peeing in My Yard? I hope you can help. First things first I like cats and dogs, but where I live I seem to attract the tom cats. They leave their calling smell (strong pee?). What's the best thing or way to try and stop this? The neighbourhood stray cats have decided to use my gardens as their own personal litter box. I was wondering if anyone knew of a way to deter them. I found a product at Walmart, but it was quite expensive. I'm way too cheap for that. Try blood meal, you put it in the dirt and the flowers like it also, keeps cats away! My grandmother scattered rose bush clippings around her gardens. The cats disliked the thorns pricking their paws, so left her plants alone. We have a year old spayed cat. She is an indoor cat at night. We've been finding lately that when we air our house out, we've got stray ginger cats coming in. They are spraying through our house, eating our cat's food. They're also fighting with our neighbor's cat, and we've all had enough. This is a guide about repelling neighborhood cats. Neighborhood cats can quickly become a nuisance, when they decide that your yard and gardens are their personal toilet. This is a guide about finding homes for stray cats. Stray kitties would benefit greatly from being given a loving home.